About 1,300 people die and 33,000 more are seriously injured each year on Australian roads and the estimated cost of road trauma to the Australian community is about $27 billion a year. Most evidence about crashes and road trauma comes from data collected after the event by the Police, coroners, hospitals, and licencing and registration authorities. In this study, 360 volunteer drivers (180 from New South Wales and 180 from Victoria) will have their private vehicle equipped with a data collection system for 4 months. 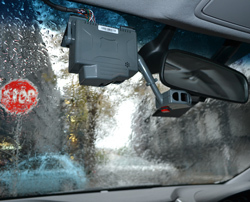 The system will silently record a participant's driving behaviour (e.g. where they are looking), the behaviour of their vehicle (e.g. speed, lane position) and the behaviour of other road users with whom they interact (e.g. other drivers, motorcyclists, cyclists and pedestrians) in normal and safety-critical situations. Each data collection system will incorporate multiple sensors (video cameras, a still camera, GPS, radar, accelerometers, etc.) to provide a complete picture of driver, vehicle and road user behaviour in all driving situations. For more information, visit the Australian Naturalistic Driving Study website. The equipment will be installed in your vehicles by MUARC Technical Officers Yik-Xiang Hue and Andrew Lyberopoulos. The tests and questionnaires will be administered by MUARC Research Assistant Rachel Osborne. The unobtrusive and compact equipment to be installed in each driver's car for a four-month long period. Note: The sensors will not issue any warnings nor prevent collisions from occurring. Audio will not be recorded unless the driver pushes a red button to describe an incident such as a near miss or a crash.